Shut it down, guys. It's over. I mean, it's not over - there's more than a day of E3 to go. But here, now, we've witnessed the peak. Not because of some loud and shouty on-stage exclusive, or a hotly anticipated sequel announcement, or even a childishly amusing video making fun of a competitor. 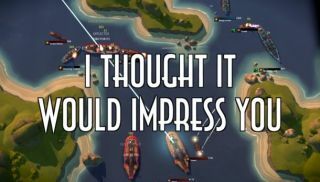 From the comfort of their conference booth, Paradox have sunk the competition by deploying the latest in the Leviathan: Warships jazz trailer odyssey. Even better, it's announcing a free Jazz Mode update that's just been added to the game. "In response to popular demand (not that we're slaves to what's popular; just doin' what feels right, you know how it is), today's update brings the sound of a new jazz music soundtrack to the game, along with the silky-smooth vocal gifts of Jazz Boatman, narrator of Leviathan's hit trailers, as a new in-game announcer." To activate it, just activate the "Big Red Jazz Button". Video games are amazing. Oh, the patch also brings a new round of tweaks, including a rebalancing of weapon damage. If, for some reason, you're more interested in that than the jazz, you can read the full patch notes here .